Since its creation in 2002, the Global Fund partnership has had extraordinary impact. In the countries where we invest, more than 27 million lives have been saved and the number of people dying from AIDS, TB and malaria has been slashed by one-third. The Global Fund delivers this impact together with a diverse range of partners including bilateral partners, multilateral and technical agencies, private sector companies, foundations, implementing countries, civil society groups, and people affected by the diseases. The Global Fund’s Sixth Replenishment Investment Case, presented at the meeting in New Delhi today and available on the Global Fund website, describes what can be achieved by a successful Replenishment, the new threats facing global health progress today, and the risks if we don’t step up the fight now. 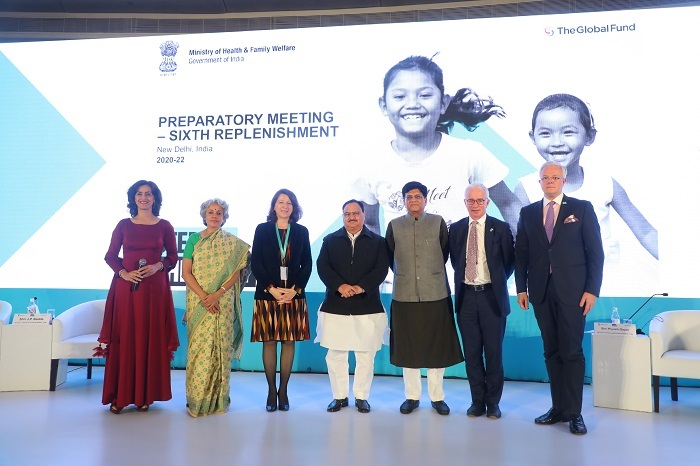 Image: (L- R) MC Shivani Pasrich; Dr. Soumya Swaminathan, WHO Deputy-Director General for Programs; Her Excellency Professor Agnès Buzyn, French Minister of Solidarity and Health; Shri J.P. Nadda, India’s Minister for Health and Family Welfare; Shri Piyush Goyal, India’s Minister of Finance and Corporate Affairs; Peter Sands, Executive Director of the Global Fund; Jean-Claude Kugener, Ambassador of the Grand Duchy of Luxembourg to the Republic of India.